S. and I spent the Thanksgiving weekend with the usual crew of regional friends, one toddler, three dogs a cat and an Aussie, this time in the Poconos. The stuffing wars between S. and I brewed on into another season (I make mine with thyme and raisins, she makes a more stripped down version). I tried to supplement my usual entry with an experimental roast fall vegetable stuffing, but owing to insufficient time-management on my part had to be turned over to another cook to be circumscribed into merely roast vegetables, sans cornbread. The day after Thanksgiving we went on a day hike. We ended up driving all over creation trying to locate a trail where we wouldn’t be imperiled by the stray slings and arrows of hunters. After driving past a number of trailheads, we arrived upon a national park, figuring that there wouldn’t be any hunters allowed. We parked and as we were headed for the trailhead, two young men in full camouflage, one toting a bow and arrows, the other a rifle came off the trail and towards us. This put a pall on our hiking party and we stopped them for questioning. They explained that it was hunting to the right, no hunting to the left, and that the hunters would probably have hiked quite a ways off the trail anyway. So we decided to proceed. The hutch at the trailhead greeted us with a litany of yellow warning postings. “Warning: Hunting season in effect.” “Warning: Beware of Bears,” and all the usual instructions on what to do if attacked by a bear. The next one was a bonus danger: “Warning: Venture off the marked trail at your own risk. This park is a former military base and may contain unexploded ordinance.” But the real kicker was a homemade bulletin with the row of tear-offs down one side listing the contact information for the nearest hospital and driving directions to get there. And two of the tear-offs had already been taken. 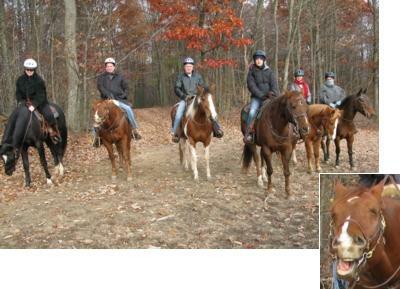 On Saturday we went horseback riding at Pleasant Valley Ranch. I don’t like horses and the only time I have ever ridden one was in probably fourth grade when a classmate and her mother rode their horses over to my parents house. I was boosted up into the saddle, wrapped my arms around the waste of my classmate and she rode me one lap up and down the dirt road off of which my parents live. Under most circumstances I would have been much less than enthusiastic about the prospect of riding horses, but as I am presently reading quite a bit of Nineteenth Century military and diplomatic history and as horsemanship plays a significant part in this tale and is major component of martial virtue in the period, I though I should get a visceral sense of it. The ranch is twenty-something acres and we rode through wooded hollows, over grassy hills and through recently harvested corn fields. The picture above is taken as we came out of a wood at the crest of a hill overlooking a valley and a ridge, along which ran a portion of the Appalachian Trail (please note the humorous expression on the face of my horse, Bogie, inset). As horses’ hooves rustled through the fallen leaves along the trails, I tried to imagine navigating the strange and uncharted byways of sparsely populated preindustrial Europe. I tried to imagine what it would be like to ride from Paris to Moscow in a column of 600,000 in the summer of 1812, happy and unaware. It was plenty cold out on Saturday, but I tried also to imagine what it would be like to be about as well dressed as I was this day, but in twenty-degree-below-zero weather on the retreat from Moscow. Where the road was boggy, I tried to imagine what it would be like for a team to pull a cannon through the mud. It was just a little two hour ride around the lot, but by the time the horses started to anticipate the end of the road I was fretting that it was over so soon. If you are looking to do something equine Pleasant Valley Ranch is a great experience. You couldn’t ask for a more easygoing, intelligent and attentive host. This entry was posted in Personal, The Long Nineteenth Century by Donald Taylor II. Bookmark the permalink.